The various EMODnet datasets have been used by a number of stakeholders for their business purposes, and so Human Activities data are no exception of that. This time we’ll take a deeper look into company Biosfera XXI. Biosfera XXI is a small yet experienced Spanish company of seven employees based in Madrid, and for several decades it has provided services focusing on environmental planning, assessment and risk to national and international projects. The company aims to provide the best possible integration of the environment into projects, creating environmentally friendly solutions. Biosfera XXI has been using EMODnet data since 2016, mainly for its marine projects, in particular, the environmental impact assessment project “The electricity interconnection across the Biscay Gulf”. The company uses EMODnet Human activity data on a daily basis, downloading datasets which allow them to separate the locations of cable installation from areas of human activities, which is the basis of the project says Marina Fuertes, Consultant from Biosfera XXI. International interconnections are the set of lines and substations that allow the exchange of energy between neighbouring countries and generate a series of advantages in the connected countries. 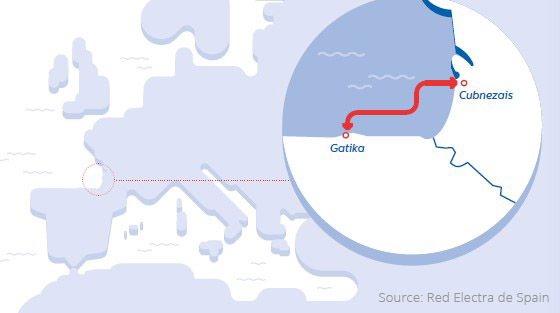 This project consists of creating an electricity interconnection across the Bay of Biscay between the French electricity grid, from one of its substations, located to the north of the city of Bordeaux, France and the Spanish electricity grid, through the Gatika substation, located in Biscay. The project poses a challenge for France, Spain and Europe in the achievement of their goals towards energy transition. For this reason, on 14 October 2013, this project was designated by the European Commission and the European Parliament as a ‘Project of Common Interest’ (PCI) within the framework of the European regulations on Trans-European energy infrastructure (347/2013). In this project, Biosfera XXI uses several EMODnet portals to collect data including Bathymetry, Geology (depth) and Human Activity, but for now, we focus on Biosfera XXI’s use of the Human Activity database and how it contributes to the success of this project”, Fuertes stressed. The coherent, harmonised, and high-quality data allows them to make informed decisions and the precision of EMODnet has also allowed them to save time and money. “Without EMODnet our project would last 15-20% longer, it provides complex data in a simple easy to understand way. It is beneficial that all EU countries use the same data”. For the future Biosfera XXI believes accessing EMODnet databases will allow the company to compete and provide project work throughout Europe, due to harmonisation with national databases providing reliable information on an EU level.